This 3A quarterfinal game features two of the most successful Kansas high school football coaches in history, as well as two of the state’s most successful programs. Silver Lake’s C.J. Hamilton, who is in his 38th season with the Eagles, is the state’s all-time wins leaders with a record of 367-84. Colgan’s Chuck Smith, who is in his 34th year with the Panthers and his 35th year as a head coach overall, is No. 5 on the Kansas wins list with a record of 320-70. As a program, Silver Lake has seven state championships and nine state runner-up finishes. Colgan has seven state titles and seven runner-ups. The Eagles have 31 all-time playoff appearances, while the Panthers have 29. They are No. 1 and No. 2 in all-time playoff victories as the Eagles have 84 and the Panthers have 75. Since the beginning of 2004, Silver Lake is 122-13. Colgan is 108-17 in the same time period. Now that we’ve had our history lesson, let’s move on to this quarterfinal matchup. Silver Lake is led by senior quarterback Dailin Kruger, who has passed for 1,635 yards and 22 touchdowns with only four interceptions this season. Kruger also has rushed for 339 yards and six touchdowns, but his ability to run has been limited since suffering a torn ACL in the middle of the season. Junior Cody Renfro leads the Eagles in rushing with 726 yards and 15 touchdowns. Junior Jace Freeman has 34 catches for 729 yards and 11 touchdowns. Silver Lake, which has represented the east in the 3A state championship the past three seasons and ten out of the past eleven years, is on a five-game winning streak since falling 27-21 to rival Rossville on Oct. 11. The Eagles have cruised past St. Marys and Hiawatha in the first two rounds of the playoffs. The Panthers are on a four-game winning streak since falling in consecutive games to Columbus and Galena. Colgan has nipped Caney Valley and Wellsville in the first two rounds. Senior Drew Dawson leads Colgan with 1,017 rushing yards and 18 touchdowns. Quarterback Luke Marquardt has passed for 1,074 yards and 11 touchdowns. Rossville won this year’s installment of the War on 24 by defeating Silver Lake 27-21. If the two Shawnee County schools can win their quarterfinal games, it will set up a rematch between the rivals. But first, Silver Lake and Rossville must get past a pair of southeast Kansas schools. Rossville has thrived this season under new head coach Derick Hammes, who joined the Bulldogs after previously directing Class 6A’s Washburn Rural. Rossville has five games in which it has scored 40 points or more, and it also has pitched five shutouts. Sophomore quarterback Tucker Horak has passed for 1,434 yards and nine touchdowns. The Rossville signal caller also has rushed for a team-high 1,595 yards and 31 touchdowns. The Bulldogs boast six players with more than 190 yards receiving. After earning an upset against Galena on a muddy field in the first round, Cherryvale cruised to a 31-0 win against Humboldt in the second round. Tristan Thornton ran for two touchdowns and made a field goal in the win against the Cubs. Zach Trim also scored on a 41-yard TD run during the victory. The Chargers have had a nice run, but the big-play ability of Rossville will be difficult to defend. 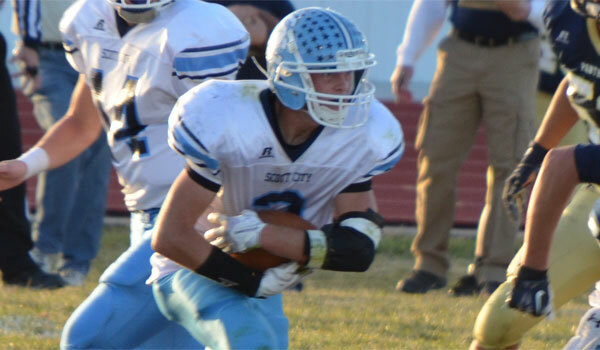 Scott City has perhaps exceeded expectations after losing a big senior class off of last year’s squad that went 14-0 and won the Class 3A state championship. As usual, the Beavers have a stingy defense and has allowed just 120 points, sixth-best in the classification. On offense, Scott City has passed for 139 yards per game and rushed for 208 yards a contest. Junior Trey O’Neil has thrown for more than 1,200 yards in the Beaver offense. Last week, Scott City won at Phillipsburg, 24-21, against a tough, physical Panther team. The Beavers outgained Phillipsburg 374-244 and had a 17-7 edge in first downs. Conway Springs is balanced with the No. 4 scoring offense at 483 points and the No. 4 scoring defense at 117 points allowed. The Cardinals earned a 54-12 victory against Wichita Independent and a 34-23 win versus Kingman in the playoffs. Dakota Finstad rushed for three scores. Conway Springs has won at least nine games in each of the last seven seasons, while Scott City has six straight double-digit win years. The Cardinals are 2-0 against Scott City in the postseason with a 39-21 victory in the 2011 playoffs and a 6-0 win in the 2007 playoffs. Conway Springs, helped by playing at home and a little more offense, earns the victory. Beloit defeated Holcomb, 60-8, in the second round of the playoffs last year. This time, the top-ranked Trojans earned a 57-30 victory last Saturday on the road. Beloit never trailed and took the opening drive 14 plays for 68 yards and a score. Holcomb cut the score to 16-14, but then Bowe Behymer returned a kickoff 92 yards for a touchdown. Beloit eventually moved the score to 41-14 before halftime. Beloit’s attack rushed for 325 yards on 62 attempts, including 25 carries for 136 yards from Behymer. He has 175 carries for 1,659 yards with 25 rushing scores for the season. Payton Vetter has accounted for 802 passing yards, 804 rushing yards and 23 scores, and Tanner Niemczyk has rushed for 965 yards and 10 TDs. Beloit leads Kansas 11-man teams in offense with 591 points. Sedgwick is second with 535 points behind standout junior quarterback Brylie Ware. The Cardinals have averaged 238 passing yards and 249 rushing yards per game. Ware has completed 148 of 239 passes for 2,481 yards with 25 scores against five interceptions. Senior Dalton Brandt has rushed 186 times for 1,636 yards and 29 scores. The Cardinals are 30-4 the last three years with three straight 10-win seasons. The only meeting between the two teams came last year when Beloit earned a 52-24 victory. Sedgwick has enough to play with Beloit, but the Trojans are playing at home and have more offense to win.